Found this at The Economist. 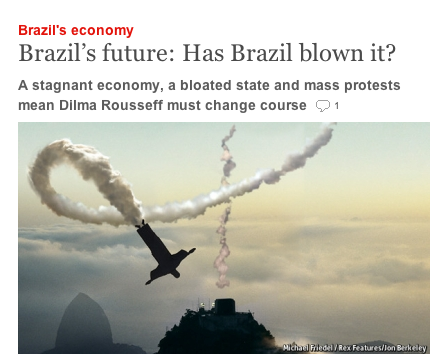 Apparently, Brazil has problems. I am not an Obama fan. Never have been. But neither am I a fan of headlines and taunts that promise one thing and deliver another. Case in point, the headline at this link and the text beneath it. Compare them with what the President says in the video at the same link. Only someone who willfully tries to misunderstand what Obama is saying in that video–the press conference in Sweden–could write the headline and accompanying text. In short, the claims at the link are bald face lies. Folks, we’re in serious times. We’re at the brink of possible war. Lives are at stake. So, sure, hold the President accountable for what he says and does about Syria, but don’t make stuff up. Now is not the time to score political points based on a willful misunderstanding (aka misrepresentation) of what your political opponent says. And yes, I’m fully aware that the current occupant of the White House and his sycophants in the media have done similar things to his opponents. Shame on all of them, red and blue.